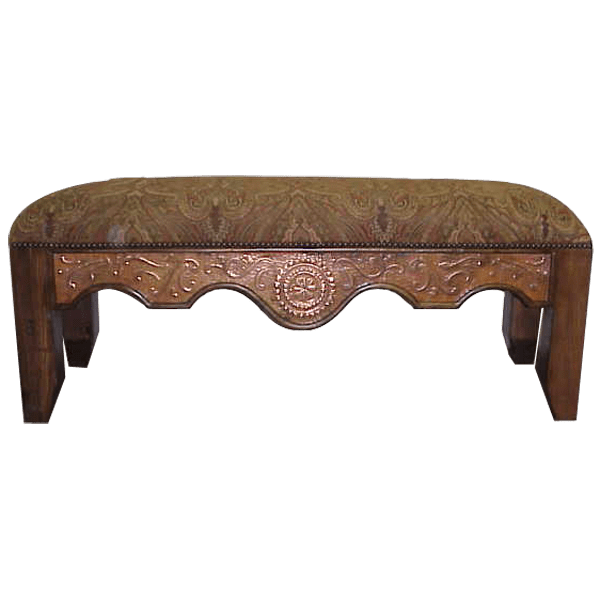 Our skilled craftsmen are experts in working with hand hammered and hand tooled copper, and their talents are reflected in this magnificent, handcrafted, Western style bench. The front of the bench has an exquisite, front apron with a Spanish colonial style, curved design. The entire apron is covered with a spectacular, hand hammered copper panel, and the panel is embellished with beautiful, hand tooled copper floral designs. The center of the panel has an opulent, hand tooled, circular copper design. For comfort, the seat is well padded, and it is upholstered with gorgeous, brown, patterned, fine fabric. The fabric is precision hand tacked to the wood frame with lovely, decorative nails. The bench is designed without a back, and it is supported by sturdy, solid wood, straight legs. It has a classic finish, and it is made with the best, sustainable, solid wood available. The bench is 100% customizable.